By Warren W. Smith, Jr. Ph.D. The Dalai Lama and the Tibetan Government in Exile’s Middle Way policy was officially announced at the European Parliament in Strasbourg in 1988. However, its origins are to be found farther back in the history of Sino-Tibetan relations. The announcement of the Middle Way policy in 1988 caused consternation among many Tibetans, who imagined that the Tibetan cause was still about independence, even though they were well aware that Tibetan envoys had negotiated with China in the early 1980s on the basis of an autonomous status for Tibet within the PRC. Many foreign supporters of Tibet and the international community in general were more welcoming of the Strasbourg Proposal because of its seemingly pragmatic character. The conciliatory nature of the proposal was in fact cited in the award of the Nobel Peace Prize to the Dalai Lama in 1989, which confirmed the wisdom of the policy for many of its proponents. The distress and demoralization experienced by many Tibetans was temporarily overshadowed by the international acclaim received by the Dalai Lama and the increased attention to the Tibet issue due to the Nobel Prize. Nevertheless, the Strasbourg Proposal and the Middle Way created a division in Tibetan society that has only widened as the policy has failed to produce any resolution with China. Tibetan society is now deeply divided between those who maintain that Tibet should hold out for independence and those who follow the Dalai Lama’s policy that Tibet must accept a status of autonomy within the PRC. As a non-Tibetan I feel that this is a debate in which only Tibetans have any right to take a position. Nevertheless, I have argued elsewhere that China will never allow any “genuine autonomy” in Tibet of the type sufficient to preserve Tibetan cultural or national identity, which is what the Middle Way is all about. Current Chinese policy in Tibet is apparently aimed at the elimination of Tibetan national identity because of the separatist threat it poses. Chinese leaders seem to have determined that the most fundamental aspects of Tibetan culture must be eliminated, or assimilated to Chinese culture, in order to repress Tibetan national identity. Ultimately, China believes that it has no need to negotiate with Tibetan exiles because it already has the solution to the Tibetan problem by means of political repression, economic development, colonization and assimilation. Many Chinese seem to believe that the demise of the Tibetan political issue will be simultaneous with that of the 14th Dalai Lama. The debate among Tibetans may thus have little ultimate consequence if Chinese policy remains so intolerant of Tibetan aspirations and so relentlessly aimed at assimilation. The independence advocates maintain that in this eventuality their position would at least preserve the historical claim to Tibet’s independence and national identity that the Middle Way would forever abandon. Despite its possible irrelevance to Tibet’s actual future, the debate between the two sides in Tibetan politics has become increasingly virulent and the TGiE has become increasingly less tolerant of criticism of its policy. The Dalai Lama’s age has seemingly increased his desire to achieve some success for his policy before he departs the scene. Despite his declaration of intention to withdraw from politics, he has recently played an even larger role in the promotion of the Middle Way. His subordinates have gone further in attempting to impose conformity to the policy among Tibetans in exile and to ostracize critics. For many Tibetans who went into exile or who were born in exile, the Strasbourg Proposal was regarded as a betrayal of what they thought was their legitimate goal of Tibetan independence. However, the Strasbourg Proposal merely made official what was already TGiE policy. In response to questions about the origins of the Middle Way policy, the Dalai Lama eventually dated its inspiration to the year 1973. He did not specify why he chose that date but it was presumably because that was when the US and China reestablished relations and the US abandoned its covert support for the Tibetan Resistance. However, the policy could as easily be said to date to 1959, when Gyalo Thondup was obliged to abandon the claim to independence in the Tibetan appeal to the United Nations due to the lack of American or international support. It could even be said to be inherent in the 17-Point Agreement whose provisions ostensibly perpetuated much of Tibet’s traditional autonomy. The most fundamental difference was that Tibet had to formally acknowledge Chinese sovereignty. Ultimately, the origins of the Middle Way are to be found in Tibet’s concept of its traditional relationship with China, or actually with Mongol Yuan (1260-1358) and Manchu Qing (1642-1912) dynasties of China. This relationship was formalized by the Tibetan side as Cho-Yon, in which Cho is Tibetan Buddhism and Yon is the political patron of the Tibetan Buddhist establishment in its role as the political authority in Tibet. The Cho-Yon relationship was established by Sakya Pandita and his nephew Phagspa as a means to forestall a Mongol invasion of Tibet in the mid-thirteenth century. Sakya Pandita’s goal was also to promote the authority of his own sect within Tibet by means of Mongol patronage and to promote Buddhism further abroad among the Mongols and their subjects. Tibetan Buddhism thereby gained Mongol patronage while the Mongol Khans gained Tibetan spiritual legitimization as chakravartins, or universal Buddhist kings. Sakya Pandita’s nephew Phagspa, who formalized the Cho-Yon system under Khubilai, declared Khubilai an incarnation of Manjushri. Contrary to modern Tibetan claims that this system was unique, or sui generis, this sort of relationship was not unique to Tibet within the Mongol Empire. The Mongols favored religious practitioners of all types in all the countries they conquered. This was due not only to their interest in all manifestations of religion, and, no doubt, to their fear of the supernatural, but also to a policy of using local religious authorities to impose and legitimate Mongol rule. Patronage of religious authorities could be manipulated to defuse discontent among subject populations while at the same time preventing the rise of any secular authority around which resistance might coalesce. The Cho-Yon, as elaborated by Phagspa, was a theory of universal empire of both spiritual and secular realms, which were regarded as equal, as were the rulers of each. The relationship was conceived as personal, between equal representatives of complimentary realms, or as the Mongols were more likely to have interpreted it, between lord and distinguished subject. Phagspa’s theory was dependent upon the extraordinary personal relationship between himself and Kubilai. It was not a theory or a practice at this time of state to state relations, despite later Tibetan attempts to interpret it as such. During the era of Phagspa and Khubilai, the idealized Cho-Yon relationship may have been realized to some extent, but, dependent as it was upon personal relationships, the idealized form of the relationship lasted only so long as did Phagspa and Khubilai themselves. Phagspa’s theory of the Cho-Yon was extremely sophisticated in its understanding of the cultural and political needs of the Mongols, but extremely naïve in anticipating political implications for Tibet. A serious flaw of the Cho-Yon relationship was that it established the Buddhist church, with its inherent dependence upon foreign patronage, as the dominant political authority in Tibet. Although the Cho-Yon relationship did not survive the era of Phagspa and Khubilai, except in theory, its effects on Tibetan politics were more permanent. Mongol patronage, not only of the Sakyapas, but of all Buddhist sects, was instrumental in establishing the political dominance of the Buddhist church in Tibet. Because the church was universalist rather than nationalist, Tibetan Buddhist sects had less reluctance than the aristocracy to accept foreign patronage. Sakya Pandita and Phagspa were more pragmatic than the secular aristocracy in accepting Tibet’s submission to the Mongols. Their primary interest was not the political status of Tibet but the propagation of Buddhism. Pagspa’s theories of the equality of the two sides in the Cho-Yon relationship obscured the Sakyapas’ political dependence upon foreign patrons and the implications of that dependence on Tibet’s political status. Phagspa achieved the potential of the relationship with the Mongol Khans envisioned by Sakya Pandita. The compromise with the Mongols also created some degree of political unity in Tibet under the Sakyapa. However, the Mongol Yuan dynasty established a political administration for Kham and Amdo separate from that of central Tibet that set the precedent for later Chinese divisions of Tibet along the same lines. The Manchu Qing dynasty was content with the nominal submission of the Fifth Dalai Lama in 1650, until the Dzungar Mongol invasion of 1720 and the Gurkha invasions of 1788-91, after each of which it imposed more direct administration. The Tibetan relationship with China was almost exclusively through the Mongol and Manchu empires and dynasties, but these foreign conquest dynasties had a different conception of their relationships with frontier dependent states than did native Han Chinese dynasties, although there were also similarities. Both aimed to establish dependent states on their frontiers as the first step toward actual administration of those areas. However, Chinese dynasties differed in that they aimed at the ultimate annexation of frontier territories, achieved by colonization and cultural assimilation. While native Han dynasties allowed autonomous political entities to exist on their frontiers, at least temporarily, autonomy was never considered to be a permanent situation. Political incorporation and cultural assimilation was always the ultimate goal because only in that way could the frontier be made secure. That this process had no ultimate limit was consistent with the conception of universal Chinese rule. The Later Han dynasty of the first two centuries of the modern era (25-220 AD) developed a system of dependent states (shu-kuo), ruled by native chieftains, known as Tu-shi, to govern areas created by Han expansion into the former territory of, among others, the frontier Chiang peoples, some of whom fled to the highlands of Tibet to become one of the progenitors of the Tibetans. The Tu-shi system was the first step in the ultimate goal of the establishment of Chinese political authority and assimilation to Chinese culture. A characteristic of the Chinese frontier feudalistic system was the award of official titles and seals of office to the indigenous rulers. These titles and seals were often employed by native rulers to legitimate their authority over their own people. Native rulers thus became dependent upon Chinese patronage. Although initially allowing a great deal of autonomy, the Tu-shi system aimed at the political and eventually cultural assimilation of barbarians through their elites. As Han colonization increased, native officials were replaced by appointed Han officials and finally the shu-kuo states were incorporated within the Chinese provincial system. This traditional strategy of Chinese expansion and assimilation was eventually applied to Tibet, particularly to Kham after the conquest of Chao Er-feng in the early twentieth century and even under the Chinese Communists, who gave honorific social and political positions to upper class secular and religious leaders during the 1950s under the United Front system, only to deprive them of all but symbolic authority as Chinese control increased. The Tibetan conception of Tibet’s traditional relations with China, as exemplified by the Middle Way proposal, is an idealized version of that relationship that differs in significant respects from the Chinese version. The Mongol and Manchu conquest dynasties of China treated Tibet, or at least Central Tibet, as something like a dependent state. However, native Han dynasties regarded Tibet not as a dependent state but as a frontier territory that had entered the traditional process of incorporation and assimilation. The vagueness of Tibet’s relationship with China, which allowed for differing interpretations, was a characteristic of the era of empires with indefinite boundaries and feudal-type relationships with surrounding states. However, the era of feudal relationships and autonomous dependent states ended with the industrial revolution and the development of modern political nationalism. The industrial revolution facilitated infrastructure development, like roads and railroads, that allowed formerly decentralized states to directly administer previously loosely controlled territories. Tibetan nationalism was aroused by the British invasion of 1904 and the Chinese invasion in response from 1905-1910. Chinese nationalism was characterized by the desire to throw off the alien Manchu rule while at the same time retaining all the territory of the former Manchu Empire. The British invasion of Tibet forced the Tibetans to reexamine their political status and their relationship with China. Tibet had previously sought Chinese protection and assistance when necessary, against the Gurkhas for instance, and denied any Chinese control when convenient, as when Tibet denied that China had the right to grant British trade relations with Tibet. When the British invaded Tibet, supposedly to secure those trade relations, the 13th Dalai Lama sought refuge in Mongolia and then in China. When the Chinese demanded greater control over Tibet, and invaded eastern Tibet and reached Lhasa, the Dalai Lama then sought refuge with the British in India. The British invasion forced the Dalai Lama to seek Chinese patronage against the British, but when the Chinese invaded he sought British patronage against the Chinese. The complimentary invasions by both the British and the Chinese forced the Tibetans to redefine their political status and stimulated the development of Tibetan national identity. Under British patronage the Dalai Lama was emboldened to declare Tibet’s independence of China and to take steps to defend that independence by creating a Tibetan Army. The influence of the Buddhist church was temporarily diminished, since it no longer had a powerful foreign patron, while that of the secular nationalist aristocracy increased under British patronage. Tibet successfully defended its independence against the Chinese in eastern Tibet and increased the territory under the administrative control of the Lhasa government. Only when the aristocracy attempted to establish a system of secular education did the monasteries react and move to force the Dalai Lama to curtail secular reforms. He was also forced to downplay the confrontation with China, leaving Tibet at his death in 1933 with a poorly defined political status. British policy toward Tibet was also unhelpful in defining Tibet’s status since Britain was willing to support only Tibetan autonomy under Chinese “suzerainty,” a term the last British resident in Tibet, Hugh Richardson, admitted was indefinable. After the death of the 13th Dalai Lama and during the minority of the14th, Tibet resisted Kuomintang Chinese attempts to force it to acknowledge Chinese sovereignty. In negotiations with China after the Dalai Lama’s death, Tibet was willing to acknowledge some Chinese influence but demanded a degree of autonomy much like what Tibetans considered traditional in relation to previous Chinese dynasties. However, the Chinese Nationalists were not content with the vague political relationships of the past, and the Chinese Communists even less so even though their nationalities doctrine professed otherwise. The Nationalists were unable to establish actual Chinese administration of Tibet, but the Communists were determined to do so. The 17-Point Agreement for the Peaceful Liberation of Tibet imposed by the Chinese Communists, after their invasion of eastern Tibet, appeared to grant Tibet, or at least that part of Tibet under the Lhasa government’s administration, an autonomous status compatible with the Tibetan conception of Tibet’s traditional relations with China. The Agreement promised no changes in the political system of Tibet, including the status and powers of the Dalai Lama. Freedom of religion was guaranteed and monasteries were allowed to keep their traditional sources of income. This last promise was sufficient to secure the approval of the monasteries. Tibetan support for the 17-Point Agreement came primarily from the monastic establishment, while opposition came mostly from secular nationalists, mostly of the aristocratic class, including members of the Dalai Lama’s own family. The 17-Point Agreement was contradictory in promising no changes while at the same time speaking of certain reforms, which would be undertaken only if the Tibetans themselves were to raise demands for such reforms. While Tibetans imagined that the 17-Point Agreement guaranteed that nothing would change in Tibet, the Chinese planned that almost everything would change according to their program for “democratic reforms” and “socialist transformation.” The Chinese Communists had no intention of allowing the traditional Tibetan social or political system to continue to exist indefinitely. Tibetans had no idea that democratic reforms meant class warfare, or that socialist transformation meant communization, and they did not know that “national regional autonomy” actually meant total Chinese control. While the Middle Way is sometimes compared to the sort of autonomy China promised in the 17-Point Agreement, the Chinese never considered such autonomy as a permanent status for Tibet. 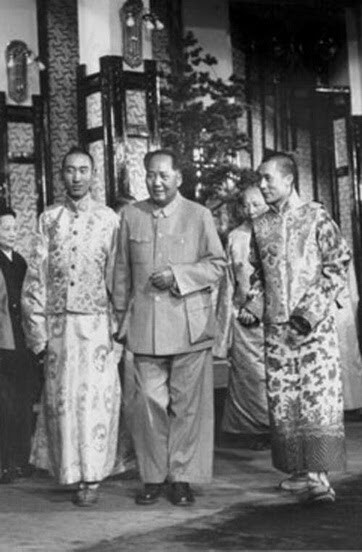 Mao once said that either Tibetans would reconcile themselves to Chinese rule or they would revolt. Either scenario, he said, would be favorable to China. Revolt would be embarrassing, even without the unanticipated escape of the Dalai Lama, but China would gain a free hand in Tibet without the need to even pretend to cooperate with an “autonomous” Tibetan government. After the revolt the Dalai Lama repudiated the 17-Point Agreement at Lhuntse Dzong on the Indian border, with the intended effect that this would reestablish Tibet’s rightful claim to independence. In India he expressed his intention to declare Tibetan independence, which the Indian Government advised against. According to a CIA eyewitness report, the Dalai Lama expressed his dissatisfaction with the advice he had been given by Indian Prime Minister Nehru to return to Tibet in 1956 and to try to work with the Chinese, saying that he and all Tibetans were now convinced that attempts to gain autonomy were useless, that Tibetans were fighting for complete freedom and independence, and that he was determined to struggle for this goal no matter how long it took regardless of the opinion of the Government of India. This resolve lasted only until Gyalo Thondup presented Tibet’s case, with American support, to the United Nations in September 1959. The Tibetan appeal referred to Tibet’s previous 1950 appeal to the UN in regard to a violation of Tibetan independence by China, which had been shelved contingent upon the possibility of a peaceful resolution of Tibet’s status, which the 17-Point Agreement ostensibly was. The Dalai Lama informed the UN that no peaceful resolution had been achieved, implying that the 17-Point Agreement had been coerced, and appealed again for a restoration of Tibet’s legitimate independence. However, the US, after discussing the issue with other UN delegations, determined that there was no support for a resolution on Tibet’s political status and instead advised the Tibetans to appeal only on the basis of the violation by China of Tibetan human rights. Gyalo Thondup was reportedly distressed at this news, particularly at the lack of support from Asian countries, but had to reconcile himself to the realities of international politics. He was told that only on the basis of human rights issues would Tibet receive a hearing at the UN at all. From 1959 to 1973 the Tibetan exile position was theoretically that Tibet was deprived of its rightful independence, while realistically Dharamsala knew that it had little international support for that position. Hopes lay with American support, particularly through the CIA for the Tibetan Resistance operating out of the Mustang region of Nepal. However, by 1968 that support had dwindled to almost nothing due to CIA dissatisfaction with the inability of the resistance to operate inside Tibet. Tibetan hopes remained for US support for Tibetan independence until the US rapprochement with China in 1973, which is presumably why the Dalai Lama later dated the origins of the Middle Way to that year. However, the choice of this date seems to have been made only in retrospect, since some statements by the Dalai Lama after that time implied that independence was still the goal. No announcement of an official change in policy was made to the Tibetans in exile, with the result that they were surprised by the Strasbourg Proposal in 1987. Even though Tibetan delegations negotiated on the basis of autonomy in the early 1980s, the popular belief among Tibetans in exile was that they were still striving for the restoration of Tibetan independence. The Tibetan delegation visits and negotiations of the early 1980s were initiated by a meeting between Gyalo Thondup and Deng Xiaoping in December 1978 in which Deng reportedly said that “anything but independence can be discussed.” This was interpreted by the Tibetan side to mean that Tibet’s political status up to but not including independence was open to discussion; that is, that the terms of Tibetan autonomy could be negotiated. However, in actual negotiations the Chinese were unwilling to discuss Tibetan proposals in regard to Tibet’s autonomous rights within the PRC. This leads to the conclusion that what Deng actually meant by his use of the word “independence” was the entire issue of Tibet’s political status as a part of China. Presumably, Deng used “independence” as shorthand for the political issue, given that the essence of that issue is Tibet’s claim to have formerly been independent of China. Whatever the interpretation, the dialogue went nowhere, but the Tibetan exile representatives did negotiate with China on the basis of an autonomous status for Tibet within the PRC. The Dalai Lama’s 1988 Strasbourg Proposal was meant to revive negotiations by formally accepting Deng Xiaoping’s condition that he “give up the idea of Tibetan independence.” It was the first official acknowledgment that he would accept the reality of Chinese sovereignty over Tibet in exchange for well-defined autonomous rights. It elaborated some of the conditions proposed by Tibetan negotiators in the early 1980s and was again based upon the “one country, two systems” status that China had offered to Hong Kong and Taiwan. It also attempted a legal definition of Tibet’s autonomous status within the PRC. Tibet’s status in relation to China was defined as one of “association,” with Tibet having a democratic political system and some international legal identity and international rights. The Strasbourg Proposal and the Middle Way policy were based upon the Tibetan contention that Tibet had been independent before 1950 and might be independent again, to be decided by a referendum of the Tibetan people. The Dalai Lama’s acceptance of Chinese sovereignty over Tibet thus appeared to the Chinese to be temporary and conditional and failed to satisfy their demand that he give up the “idea of independence,” past, present and future. The status of “association” meant to define Tibet’s relations with China was proposed by the Dalai Lama’s Dutch legal adviser, Michael van Walt, in his book, The Status of Tibet, which was, essentially, a legal brief commissioned by Dharamsala. The “associative status” argument is based upon the 1960 United Nations Resolution1514, “Declaration on the Granting of Independence to Colonial Countries and Peoples,” and the accompanying Resolution 1541, which set out the means by which a non-self-governing territory might reach a full measure of self-government, including independence, free association, or integration with another state. Application of this UN resolution to Tibet would require that Tibet be defined as a non-self-governing or colonial territory, which the PRC would of course never admit. The status of “free association” was claimed to be the means by which Tibet might achieve self-determination, if a majority of Tibetans voted to accept an autonomous status within the PRC. However, the flaw in this argument is that self-determination is not a one-time choice; self-determination implies that a population might choose a different status at any time. Tibetans’ acceptance of autonomy by referendum at one time does not mean that they could not choose independence at another time. The Strasbourg Proposal may represent an overestimation by Tibetans of their leverage at the time, given international pressure and the unrest within Tibet, combined with the ostensible Tibetan acceptance of Deng Xiaoping’s conditions for a resolution of the Tibet issue. The status of free association was described by Van Walt as similar to the protectorate relationship, but different in that the associated state would have the unilateral power to alter the association at any time by exercise of a democratic choice. Associative status was therefore claimed to offer a pattern for the future for the transition to self-government of formerly dependent or colonial states. But he also claimed that the status was particularly appropriate to Tibet’s situation since it “bears significant similarities to the traditional Cho-Yon relationship.” This assertion reveals the archaic rather than progressive nature of the Strasbourg Proposal as well as the Middle Way policy. By means of Van Walt’s legal arguments, Dharamsala appeared to be attempting to undo its acceptance of the 17-Point Agreement and to return to a traditional relationship with China of an earlier political era. However, despite the attempts to characterize this sort of relationship as modern and progressive, rather than archaic, the era of empires and dependent states had long ago given way to the modern era of national states that exercise uniform sovereignty and administration over all their territory. Despite Van Walt’s attempt to characterize autonomous “associative” status as relevant to the modern world and as the solution to other issues of disputed sovereignty, the world was moving in the opposite direction, toward resolution of such disputes by means of independence, gained usually after violent conflict, or total absorption and integration by the dominant state. Needless to say, the Strasbourg Proposal and the Middle Way policy have not resulted in a resolution of the Tibet issue. China has instead resorted to its own traditional policy for the resolution of frontier issues by means of colonization and assimilation. China engaged in two series of “dialogues” with Tibetan representatives, who it characterized as personal representatives of the Dalai Lama, in which it refused to talk about any issues except the personal status of the Dalai Lama. China is now apparently uninterested in any more dialogue; its policy appears to be to await the demise of the Fourteenth Dalai Lama, which many Chinese leaders seem to think will resolve the issue once and for all in China’s favor. China has scornfully and repeatedly rejected the Middle Way as the basis for dialogue and it has further curtailed autonomy in Tibet after the uprising of 2008 demonstrated the persistence of Tibetan national identity and dissatisfaction with Chinese rule. The Middle Way having apparently been rejected by Beijing with finality, its only lasting effect is a tragic division among Tibetans. That division was once just a difference of opinion but has increasingly become an attempt by one side to silence the other. Some Middle Way supporters seem to think that they must follow the Dalai Lama and that to oppose him is equivalent to disloyalty or even treason against the Tibetan cause. This type of loyalist Tibetan fails to make the distinction between the incarnate deity and the nation he represents. Others maintain that China would dialogue with exile representatives and perhaps accept the suggestions of the Middle Way policy if only they could believe that all Tibetans in exile had truly given up independence. Chinese officials may be suspected of having suggested as much in talks with Tibetan exile representatives. Or perhaps they had no need to do so, since Tibetans in exile might logically assume that China would negotiate if it believed that Tibetans had given up independence. Samdhong Rinpoche has led the effort to silence critics of the Middle Way policy, first by suggesting that Tibetans not demonstrate against Chinese leaders on their foreign visits, then by organizing seminars on the Middle Way in Tibetan settlements that include the suggestion that opposition to the policy is equivalent to opposition to the Dalai Lama himself. Proponents of the Middle Way see it as the only reasonable choice and also as acceptable to China because it is, for the most part, in compliance with the Chinese Constitution and the Regional Ethnic Autonomy Law (formerly National Regional Autonomy Law). It differs only in demanding more, or “genuine,” autonomy over a unified Tibetan nationality territory. However, the demand for “genuine” autonomy implies that the autonomy Tibetans now supposedly enjoy is not genuine. A unification of all Tibetan autonomous regions and districts into one Greater Tibetan Autonomous Region also seems reasonable since all the territories involved are already designated as autonomous Tibetan (or combined Tibetan/Mongol or Tibetan/Kazakh) territories. However, the PRC divided Tibetan autonomous territories based upon historical justifications dating from the divisions of Tibet by the Mongol Yuan dynasty, even though historical divisions were theoretically not supposed to be taken into account. Autonomous regions were supposed to be based upon “contiguous occupation” by the minority nationality in question, which would make all Tibetan areas part of one autonomous region, except that political reasons were the real justification for the divisions. The Memorandum on Tibetan Autonomy submitted to Chinese officials in 2008 is indeed reasonable assuming that China actually wants to allow Tibetan autonomy and to permit Tibetan culture and Tibetan national identity to survive. However, it is increasingly apparent that this is not what China wants. The Chinese Communists in the early 1950s imagined that Tibetan separatism would last only for a short time after Tibet’s “peaceful liberation.” However, they underestimated the strength of Tibetan culture and they overestimated the efficacy of CCP nationality policies. They have been continually surprised at the persistence of Tibetan culture and Tibetan resistance to Chinese rule, most recently during the liberalization era of the 1980s. And they are perpetually angered and irritated that Tibet has remained an international issue. They deny that there is really any discontent among Tibetans and imagine that international support for Tibet is nothing but Western interference aimed at denigrating China and preventing its legitimate rise to a position of leadership in world affairs. They are aware that Tibetan culture is the basis for Tibetan separatism, so they are unsympathetic to demands for any increased or “genuine” Tibetan autonomy. Tibetan national identity and Tibetan nationalism are thus what China is determined to eradicate, not perpetuate. Middle Way proponents typically fail to understand China’s motives in regard to Tibet as they characterize the Middle Way as beneficial to both Tibetans and Chinese due to its potential to promote harmony. However, ethnic harmony is not so much a Chinese priority as is national unity, territorial integrity and the elimination of Tibetan separatism. In any case, what China means by “harmony” is enforced conformity and suppression of dissent. Tibetans also tend to dismiss as propaganda or even as “negotiating tactics” all of China’s denunciations of the Dalai Lama, its refusal to negotiate about Tibetan autonomy and its rejection of the Middle Way. They do not understand that for the Chinese Communists propaganda is actual policy. They fail to realize that international pressure is no longer sufficient to move China on Tibet or any other issue, if it ever was. The Middle Way policy has been successful in gaining international support for dialogue about Tibet and its proponents are therefore reluctant to give up that support despite the lack of any progress with China. Some of those who oppose the Middle Way do so because they realize that China will never negotiate on that basis since it has no intention of allowing any “genuine” Tibetan autonomy. Their promotion of Tibetan independence, or Rangzen, may be unrealistic, but they maintain that it is less unrealistic than the illusion that China will ever allow Tibetan autonomy sufficient for the survival of Tibetan national identity. The difference between the two sides among Tibetans often comes down, as it always has to a large extent, to their relative religiosity and loyalty to their spiritual leader, the Dalai Lama. As was the case during the debate over accepting or rejecting the 17-Point Agreement, the religious establishment and the more religious among the population has preferred compromise with China even at the expense of Tibetan independence, while the more secular nationalists have preferred a policy of no compromise on the fundamental issue of independence. Tibetan history is replete with examples of the anti-nationalist, universalist interests of the Buddhist establishment in contrast to the more nationalist interests of the secular aristocracy. The Tibetan Empire, the only era of a unified and independent Tibet, was the creation of a secular aristocracy, united for the first time by the kings of Yarlung. The Empire was sustained by the Bon religion, not by Buddhism, which overcame Bon in influence only during the latter part of the Empire. However, Buddhism may well be responsible for its demise. Modern research by Samten Karmay has revealed that Lang Dharma, characterized in Tibetan Buddhist history as a persecutor of Buddhism, was actually only trying to curtail the excess privileges granted to the clergy by his predecessor, and brother, Ralpachen. The Tibetan Empire, then, may well have been brought down by a reaction from Buddhist monks denied the privileges to which they had become accustomed. With the collapse of the Empire came the collapse of organized Buddhism as well, given that the clergy had also benefitted from the patronage of a centralized state. Tibet was unified again only four hundred years later, when Sakya Pandita submitted to the Mongols. Submission may have been the only alternative to an all-out Mongol invasion, but Sakya Pandita and his nephew Phagspa willingly sacrificed Tibetan independence for the sake of Buddhism. They were primarily interested in promoting Buddhism to the Mongols and Chinese and they were amazingly successful in doing so, but they forever compromised Tibetan independence. The Fifth Dalai Lama established the political supremacy of the Buddhist Church only with the foreign military patronage of Gushri Khan, who was declared “King of Tibet.” For the subsequent two and a half centuries of the Manchu Yuan dynasty of China, the religious establishment was far more willing to accept Manchu patronage, and generous gifts to monasteries, than was the secular aristocracy, which made some attempts to maintain Tibetan autonomy, if not independence, in relation to the Manchu. The Thirteenth Dalai Lama took advantage of the collapse of the Manchu Yuan Dynasty to declare Tibetan independence, but he did so only with British political patronage and British support for secular reforms, like creation of an army and establishment of a more representative political system. His secular reforms were fatally compromised by the opposition of the monasteries, which had long prospered under Chinese patronage and were more interested in the opportunities for the promotion of Buddhism in China than in Tibetan independence. Secular reforms, including the creation of an army and secular governmental institutions, were a direct threat to their control over culture and polity in Tibet. After the Chinese invasion of 1950, it was the religious establishment that favored accepting the 17-Point Agreement while several of the secular nationalist aristocracy opposed it. Despite his previous experience that Tibetan autonomy under China was not possible, the Dalai Lama has become the foremost proponent of compromise with China. He, like Tibetan lamas before him since Sakya Pandita and Phagspa, seems more interested in the promotion of Buddhism than Tibetan nationalism. The Buddhist doctrine is in its essence universalist and anti-nationalist. Buddhism has no national identity or national boundaries; its goal is human enlightenment rather than the more narrowly constricted goal of national political independence. The Dalai Lama has said that Tibetan “happiness” is the ultimate goal and that he would accept autonomy under China if that were achieved. He has often said that Tibetans could benefit economically by being part of a prosperous Chinese state. He has said that all Tibetans, himself included, would prefer independence, but that independence is an unrealistic goal. This of course implies that he thinks autonomy is not an unrealistic goal, which means that he does not understand why China rejects “genuine” Tibetan autonomy of the type he proposes. It also implies his lack of understanding of the need for an independent state within which to exercise genuine Tibetan human rights, especially the most fundamental right of national self-determination. The Dalai Lama has repeatedly said that more and more Chinese are supporting Tibet and that many are becoming Buddhists, which he apparently assumes to mean that they would be more sympathetic to Tibet. As for Chinese support for Tibet, the TGiE has researchers constantly looking through Chinese websites for any positive comments about Tibet and they report all such evidence to the Dalai Lama, who has cited ever increasing numbers of such expressions of support. However, this is an exercise in self-deception. In fact, since 2008 Chinese society has become more anti-Tibetan than ever before. The Chinese reaction to the uprising and the protests against the International Olympic Torch Relay was one of the main sources of a new Chinese anti-Tibetan, anti-Western nationalism. Many Chinese regarded the uprising in Tibet as an attempt, supported by anti-China foreigners, to denigrate China just as it was trying to present its new face to the world via the Beijing Olympics. Supporters of the Middle Way point out its reasonableness and its compatibility with already existing Chinese law and argue that China will eventually see its advantages. However, China has failed to see its advantages for quite some time since it was formally proposed in 1988. And, since the Middle Way’s origins lie farther back in Tibetan history and Sino-Tibetan relations, particularly in the 17-Point Agreement, China may think that it has already tried such an arrangement and that it failed because of Tibetan resistance. In fact, China was never sincere about the promises of autonomy to Tibet contained in that agreement, but it did learn that Tibetan resistance was more persistent than it imagined, a lesson it had to relearn during the period of liberalization in the 1980s. The persistence of Tibetan nationalism and separatism is the reason that China now fears to allow any real autonomy at all and why it sees no advantage in negotiating with the Dalai Lama about allowing even more autonomy in Tibet. The Dalai Lama’s Middle Way Policy is essentially a proposal by Tibetans in exile to reverse history and return to an earlier era when China’s authority over Tibet was mainly symbolic. The Middle Way is an attempt to restore a sort of Tibetan autonomy that was already an anachronism in 1950 when China was finally able to substantiate its historical claim to sovereignty over Tibet. It proposes a return to a type of political relationship between China and Tibet that existed only in a previous era. Tibetan autonomy existed only because the Mongol and Manchu empires did not have the ability to actually control and administer Tibet, or the need to do so except in the case of threats from outside powers. Modern China had more nationalistic ambitions to exercise actual sovereignty over Tibet and a greater ability to do so. Republican China was unable to achieve actual administrative control over Tibet, although it claimed to the world that it did. British support for Tibetan autonomy under Chinese “suzerainty” was an attempt to perpetuate a type of political relationship of an era that had already passed. The nationalist and anti-imperialist Chinese Communists were not about to allow any such vague status of a former imperial era to survive into the “New China” of their creation. The Chinese Communists were determined to establish actual Chinese sovereignty and administration over Tibet and they had the means to do so with a veteran army and the absence of any outside power capable of opposing them. They promised a system of autonomy for Tibet almost equivalent to Tibet’s previous status of de facto independence. However, they considered Tibet’s “peaceful liberation” and its “return to the Motherland” as the achievement of China’s long-held ambition to exercise actual sovereignty over Tibet. What was promised in the Seventeen-Point Agreement for the Peaceful Liberation of Tibet, and what the Middle Way would like to restore, was for the CCP only a temporary arrangement until actual military and political control could be established. For the Chinese Communists to allow Tibetan autonomy such as the Dalai Lama proposes, or even that they themselves once promised, would be contrary to what they have proclaimed as a natural and inevitable “merging of nationalities,” and a reversal of what they regard as one of their greatest accomplishments. The Chinese typically think of Tibet more as a territory than as a people with any rights to the land itself or to any of its resources. Current Chinese activities in Tibet are incompatible with any Tibetan rights to their own territory or their own natural resources. China’s policy is that all land and resources are the property of the Chinese state, which is a clear expression of China’s conquest mentality in regard to Tibet. China’s primary development efforts in Tibet are now devoted to mining and tourism. Both are essential aspects of China’s plan for Tibet’s economic development and its integration within the Chinese economy. Both have important assimilative purposes and effects. Tourism is aimed at turning Tibet into something like a theme park where Chinese can go to indulge their fantasies about primitive Tibetan society and where they can be entertained by Tibetans singing and dancing in gratitude for their liberation from their own backwardness. Theme parks and cultural performances are being developed in Lhasa where Chinese tourists can experience an unthreatening version of Tibetan culture and an altered version of Tibet history in which Tibet has “always” been a part of China. Fake Tibetan “model villages” are being built in lower areas of eastern Tibet like Nyingtri in Kongpo where Chinese tourists can live in Tibetan houses and be entertained by Tibetan singers and dancers. Tourist numbers reached almost 13 million in 2013 of whom 99 percent were Chinese. The perpetual presence of so many Chinese tourists in Lhasa significantly alters the population balance and cultural dynamic. Chinese mining in Tibet is also contradictory to any concept of Tibetan autonomous rights to their own natural resources as proposed by the Middle Way policy. Tibetans currently receive no economic benefits from Chinese mining activities, whether in jobs or profits, but they suffer all the negative environmental consequences. Chinese mining in Tibet is for the benefit of China, not Tibet. Contrary to the typical assumption that China has already extensively mined all the mineral resources of Tibet, mining on the scale necessary to exploit most mineral resources is only just getting underway due to the previous lack of infrastructure like roads, railroads and hydroelectric power. Mining, like tourism, increases the numbers of Chinese in Tibet and creates isolated enclaves of Chinese where large mines are located. Mining is particularly contrary to any Tibetan autonomous rights in regard to resources or exclusive Tibetan rights to inhabitation. There is no indication that China wishes to give up its full sovereignty in favor of Tibetan autonomy, or any logical reason that it should do so, especially when any such autonomy is contrary to China’s economic and political interests. China has no intention of abandoning its rights to exploit Tibet’s natural resources when mining on a large scale is finally becoming feasible. China has no intention of giving Tibetans the right to exclusive inhabitation of their own land when the Chinese regard Tibet as a relatively empty part of China open for Chinese colonization and exploitation. And China has no intention of allowing any autonomy in Tibet that would perpetuate a separate Tibetan culture and national identity and the consequent Tibetan separatist threat to China’s territorial integrity and national security. China’s response to the Middle Way, and specifically to the Memorandum on Tibetan Autonomy, leave little doubt that China has no intention of allowing any “genuine autonomy” of the type proposed. Given the lack of any positive Chinese response to the Middle Way proposals, the only question is how long will the Tibetans in exile maintain this position? The meetings that China has conducted with Tibetan exile representatives cannot be said to have been a genuine dialogue since the Chinese side refused to talk about Tibetan autonomy at all. Their invitation to the Tibetan side in July 2008 to explicate what they meant by “genuine” autonomy appears in retrospect to have been either a mistake by a junior official or a ploy to defuse international criticism and Tibetan protests just before the Olympics. The scorn and finality with which the Memorandum on Tibetan Autonomy was rejected after the Olympics left little hope for any further dialogue and, indeed, to this point there have been no further meetings. The most recent series of meetings seem to have been little more than a delaying tactic by China, one that also served to persuade the world that China was open to dialogue and thus to satisfy foreign critics’ constant demands that it do so. China now seems to not care enough about foreign criticism to even make a pretense of willingness to dialogue. Chinese policy now appears to anticipate a time when the 14th Dalai Lama has departed and a 15th has been named by the CCP. This timing may also be the answer to the question about how long Tibetans will support the Middle Way policy. Presumably, only after the demise of the 14th Dalai Lama will a realistic reappraisal of the policy be possible. Much of the support for the policy at the present is based upon loyalty to the Dalai Lama, a condition that will be lessened with his departure. Even then, Tibetan loyalty to his legacy will be an important factor. There is a remote possibility that the Dalai Lama could renounce his own policy at the end of his life, given his realization that the Chinese would be less likely to negotiate after he is gone than before. But, to renounce the Middle Way would be to renounce much of his own legacy. However, he could, by renouncing his own failed policy, create a new legacy. He might rationalize that he had tried to be conciliatory, as in the 1950s, but now, as after the 1959 revolt, had decided that autonomy under China was impossible. He might then revive the claim for Tibetan independence. Certainly, this would be the best way to defy the Chinese expectation that his demise would be the end of the Tibet problem and it would also be the best way to provide a continued inspiration for Tibetans. The aspiration for independence may be all that Tibetans ever get, but, as the independence advocates have pointed out, it is the abandonment of that aspiration that is the most demoralizing aspect of the Middle Way. Only a repudiation of the policy by the Dalai Lama himself would heal the rift in Tibetan society caused by that policy. Tibetan independence may be unlikely, but the claim to rightful independence is essential for the preservation of Tibetan national identity. The claim of Tibetan independence in the past as well as the legitimate right of independence in the present is essential for the sake of a truthful and authentic Tibetan history as opposed to one rewritten and falsified by the Chinese. In this paper I use Tibetan Government in Exile (TGiE) rather than Central Tibetan Administration (CTA) because the latter term has no meaning in relation to Tibet’s status within the People’s Republic of China (PRC), which is what the Middle Way is supposed to address. Central Tibetan Administration is a term adopted to refer to the administration of the Tibetan refugee settlements in India and was intentionally meant to exclude any claim to be a government in exile. This change was made reportedly in order to avoid offending India, or China, or both, but it did not change the character of the Dharamshala government, which remains for all intents and purposes a government in exile. I also use Middle Way rather than Middle Way Approach (MWA) because “Way” and “Approach” are essentially the same thing. China’s Tibet: Autonomy or Assimilation (Boulder, Rowman and Littlefield, 2008); Tibet’s Last Stand: The Tibetan Uprising of 2008 and China’s Response (Boulder, Rowman and Littlefield, 2010). Turrell Wylie wrote, “The exploitation of religious leaders at the expense of secular lords in order to subjugate foreign populations was a sociological pattern not unknown to the Mongols. Therefore, given the fragmented and dichotomous nature of Tibetan society at the time, it was logical that Prince Kotan would select a lama than a layman to surrender Tibet.” Turrell Wylie, “The First Mongol Conquest of Tibet Reinterpreted,” Harvard Journal of Asiatic Studies (1977), 112. Michael van Walt van Praag, The Status of Tibet: History, Rights and Prospects in International Law, (Boulder: Westview Press, 1987). Van Walt, Status of Tibet, 202. Samten G. Karmay, “King Glang Dar-ma and his Rule” The Arrow and the Spindle, Studies in History, Myths, Rituals and Beliefs in Tibet, Vol II. (Mandala Publications, Kathmandu, 2005), 15.